Moved Franz Bakery to the west side. Moved the yard to the west side. Moved all shelves in to 18″ or 16″. 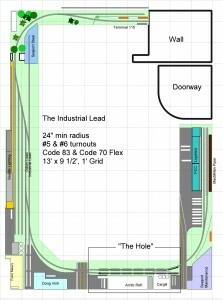 Instead of detailing each iteration of the track plan, I’ve skipped ahead to Track Plan #13. 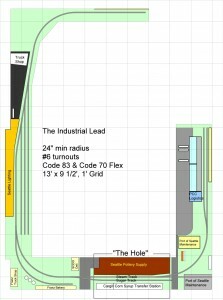 This does stray some from the prototype track arrangements, but I think it’s as honest as can be given the space and desired industries. I’ve added a runaround and two additional industries to make it more challenging. Seaport Steel is located on the South Leg of the West Seattle WYE. It takes falt cars with steel plates and shapes. Terminal 115 is located in West Seattle, at the end of the Avenue. It takes a lot of random specialty loads; including flat cars with machinery, flat cars with pipes. I’ve decided it’d be best to keep the shelves under 18″. I had planned on modelling Seattle Pottery on the North side of the Hole tracks, but I decided it would be difficult to couple and uncouple cars with this building in the way. 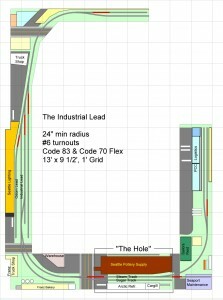 I still have PCC logistics in front of the tracks, but I think I’m willing to live with the difficulty of coupling and uncoupling here, because I ‘ll be mostly pulling and spotting the entire track at once. 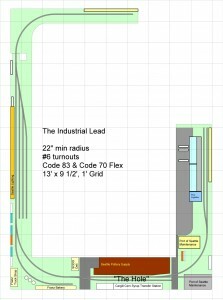 I’ve moved the yard so it is next to Seattle lighting and moved the Odom Lead to function as an actual lead track. I think this arrangement gives me the optimum storage space and switching realism. In real life there is no yard and the Odom Lead is adjacent to Seattle Lighting and stubs out at Hanford Street.